I like to volunteer in my community. Doing so enables me to make a difference in other people’s lives and make some small contribution in return for the benefits I receive. But, years ago when I was asked to serve on my community’s Planning and Zoning committee it felt like I was in over my head. Will I make wise decisions regarding land use in my community? Will I understand the complicated zoning codes and different land use tools such as comprehensive planning? Will I carry out my duties and responsibilities correctly and wisely – and legally? How will I deal with heated community response in difficult circumstances? At least I was in good company – many volunteer planners continue to express the same concerns and struggle to find where to turn for accurate, useful and easily understandable information. To make matters worse, local land use issues are becoming increasingly complex, requiring difficult decisions of volunteer citizen planners who often have little preparation or training. 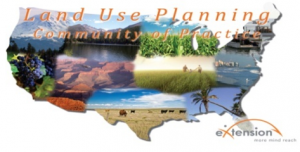 Fortunately, the new American Citizen Planner Program (ACP) can help prepare and train these volunteer planners as well as others who are interested in the basic concepts of public land use planning and community development best practices. Just recently launched online through the eXtension Community Planning and Zoning Community of Practice, ACP provides continuing education for paraprofessional planners and zoning officials, offering the nationally recognized credential of Master Citizen Planner. The online program offers two courses – ACP 101 and ACP 201. ACP 101 is designed to help participants learn the foundations of planning and zoning, including the historical context, and their role and responsibilities as planning officials. The 14 units cover such topics as ethics, comprehensive land use planning, working with the public, data collection and analysis, and community sustainability. ACP 201, also 14 units, digs deeper into such topics as land use planning, legal and constitutional authority, the zoning process, conducting effective public meetings and dealing with conflict. After completion of ACP 101 and 201, participants are qualified to take the Master Citizen Planner Exam. With an exam score of 70% or better, within 60 days of completing the courses they will receive the Master Citizen Planner Credential. It is recommended that the credential be maintained through at least 6 hours a year of continuing education. Learn more about the American Citizen Planner program, its cost and how to access the online courses here or by contacting Myra Moss at moss.63@osu.edu.